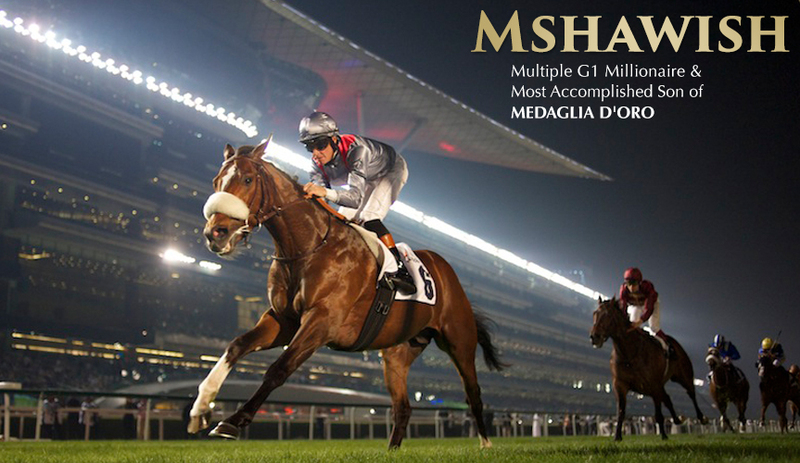 "Mshawish was a very talented racehorse. I think he has a license to make a successful run as a stallion as anyone out there. He was an accomplished horse out of a pre-potent sire line. [$170,000 filly purchased at KEENOV] is a lovely filly and a great mover. She is a top individual." 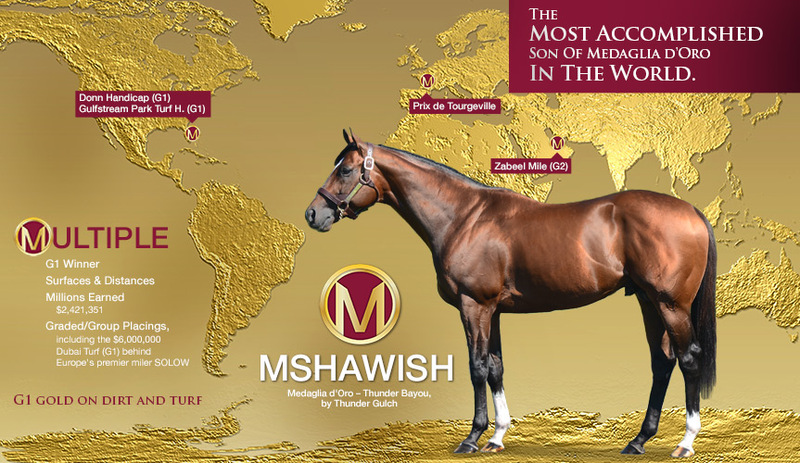 "Mshawish is showing all the signs of being a great value sire. He's an outstanding physical and was a tough as they come racehorse. First foals are solid!" "The most handsome Thoroughbred on earth. #MSHAWISH"
First weanlings sold for $170,000, $160,000, etc. Al Shaqab Racing's grade I winner Mshawish will get a freshening at Belmont Park with trainer Todd Pletcher before turning to a summer campaign. "A remarkably tough, adaptable and consistent performer, Mshawish has captured seven black-type events, scoring on dirt and turf, and on three different continents, his triumphs including the Donn Handicap (gr. I) and Gulfstream Park Handicap (gr. I). Mshawish is a product of the hugely successful cross of Medaglia d’Oro and his sons over Mr. Prospector line mares, one that has produced no less than 29 stakes winners. He has unusual pedigree pattern in that his dam is by Thunder Gulch, a Mr. Prospector/Storm Bird cross, and is out of Bayou Storm, a Storm Bird/Mr. Prospector cross. Although the dam of Mshawish is inbred to Mr. Prospector, these crosses will be in the fifth and sixth generation of his foals, and we can also note that there are already more than 30 grade one winners who carrying three cross of Mr. Prospector, so reintroducing this strain should not cause concern. Medaglia d’Oro has done particularly well with Mr. Prospector via Forty Niner, this cross yielding the spectacular performers Rachel Alexandra (out of a mare by Roar) and Songbird, as well as a graded stakes winner out of a mare by Forty Niner himself; two graded stakes winners out of mares by Distorted Humor, and a stakes winner out of a mare by Trippi (by End Sweep). Forty Niner might also be brought in through Coronado’s Quest, Editor’s Note, Luhuk, Tactical Advantage and Twining. Medaglia d’Oro is sire of grade one winner Violence out of a mare by Gone West, and he also has multiple graded stakes winning millionaire Valid out of a mare by Gone West son, Grand Slam, which suggests trying mares by Speightstown (who is a parallel cross to the broodmare sire of Mshawish, and a reverse cross to the granddam of Mshawish), Mr. Greeley (who looks interesting here), Elusive Quality (whose dam is a Northern Dancer/Sir Ivor cross, like El Prado, the grandsire of Mshawish, who is sire of Quality Road, who could be interesting here and Smarty Jones), Proud Citizen and Canadian Frontier (sire of the brilliant Hilda’s Passion out of a mare by El Prado, and giving linebreeding to the three- quarters brothers Sadler’s Wells and Nureyev). Kingmambo, who carries Sadler’s Wells’ three-quarters brother, Nureyev, has done well under the Sadler’s Wells line in general, and Medaglia d’Oro has a graded stakes winner out of Kingmambo mare, and is also sire of grade one winner Lochte out of a mare by that horse’s son, Lemon Drop Kid. Mshawish already carries Seeking the Gold, a Mr. Prospector/Buckpasser cross, and Medaglia d’Oro has also sired stakes winners out of mares by Woodman and Miswaki (sire of Black Tie Affair), who are bred on the same cross, so introducing them should be positive. There are also Medaglia d’Oro graded stakes winners out of mares by Mr. Prospector line stallions Machiavellian (sire of Street Cry, and grandsire of Street Sense); Smart Strike (whose son, English Channel, brings in Nureyev); Jade Hunter; Smoke Glacken (by Two Punch); and stakes winners out of mares by Marquetry (sire of Artax); Fortunate Prospect and Crafty Prospector (sire of Robyn Dancer and Prospectors Gamble). In general, most versions of a Mr. Prospector/Northern Dancer cross would be beneficial, although we should note that Medaglia d’Oro and El Prado have tended not to display much affinity for the Fappiano branch of Mr. Prospector. Medaglia d’Oro is from the male line of Sadler’s Wells, and Sadler’s Wells’s three-quarters brother, Nureyev, is to be found in the pedigrees of ten stakes winners by Medaglia d’Oro and his sons, including the grade one winner Gabby’s Golden Gal, who is by Ashkalani, a son of Nureyev stallion, Soviet Star. 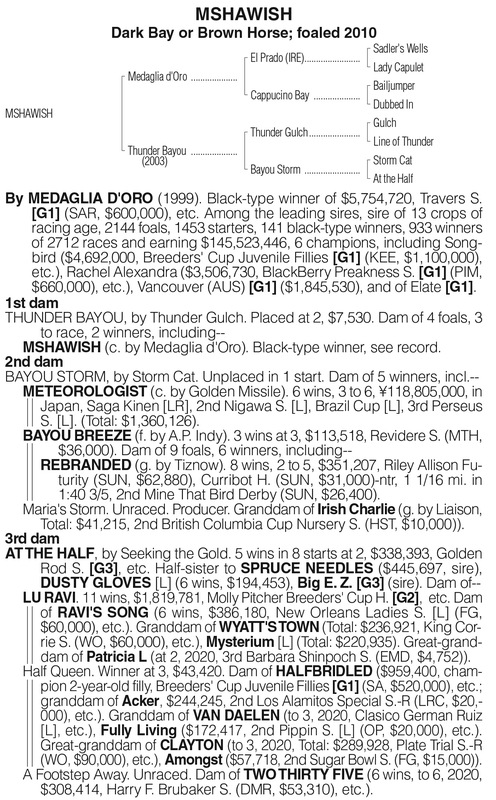 There is also a stakes winner by a son of Medaglia d’Oro out of a mare by Nureyev son, Theatrical. Other sources of Nureyev, include Atticus (who appeals here), Fasliyev (who is a something of a reverse cross to Mshawish), Spinning World, Unusual Heat and Zilzal. Medaglia d’Oro has sired six stakes winners out of mares by stallions from the Danzig branch of Northern Dancer, including Champion Two-Year-Old Vancouver, who is out of a mare by Danehill, a line of Danzig that has done particularly well under Medaglia d’Oro. There are also graded stakes winners on this cross out of mares by War Chant and Pine Bluff. Other sources of Danzig that might work well are Belong to Me, Boundary (whose son, Big Brown, would bring in Nureyev), Chief’s Crown (who would give linebreeding to the Northern Dancer/Secretariat cross that is in Mshawish through Storm Cat, and who is available through Concerto and Bellamy Road), Danzig Connection (a Northern Dancer/Sir Ivor cross, like El Prado, the grandsire of Mshawish), Exchange Rate (who is a parallel Northern Dancer/Seeking the Gold cross to the granddam of Mshawish), Hard Spun (who is a Northern Dancer/Raise a Native cross, a reverse to the broodmare sire of Mshawish, and a parallel to the granddam of Mshawish, but with the Raise a Native through Alydar rather than Mr. Prospector) , Langfuhr, War Front and Honor Grades and Lost Soldier (both Northern Dancer/Secretariat crosses). Mares descending from Danzig son, Green Desert, a parallel Northern Dancer/Sir Ivor cross to El Prado, would also work well but are hard to find in the U.S.
Medaglia d’Oro is sire of grade one winner Coffee Clique out of a mare by Royal Academy. Royal Academy is a son of Nijinsky II, a branch of Northern Dancer that looks promising here, as the dam of Mshawish is inbred to Storm Bird, a horse bred on very similar lines to Nijinsky II. Sources of Nijinsky II would include Sword Dance (who is bred on the same cross as Storm Cat, who is in the dam of Mshawish), Sky Classic, Strawberry Road, Shadeed (by Alydeed) and Seattle Dancer. Medaglia d’Oro has a disappointing strike-rate with Storm Cat line mares, but given the pedigree of the mare, it could be worth carefully experimenting with mares by Storm Cat sons and grandsons, particularly ones with the Storm Cat/Mr. Prospector or similar crosses such as Tale of the Cat (sire of Lion Heart), Forest Wildcat, Storm Boot and Storm Creek, or Forestry, who is from Mr. Prospector’s family. From the line of Icecapde, a three-quarters relative to Northern Dancer, Medaglia d’Oro sired the very talented Atreides out of mare by Wild Rush and a stakes winner out of a mare by Vicar, both sons of Wild Again. This would suggest considering daughters of Milwaukee Brew, Offlee Wild and Whiskey Wisdom. Medaglia d’Oro also sired graded stakes winner Rydilluc out of a mare by Icecapade son, Clever Trick, sire of Phone Trick (himself sire of Caller I. D., Favorite Trick, Mazel Trick and Zavata) and Tricky Creek. Out of mares by Roberto son, Kris S., Medaglia d’Oro has sired grade one winner Marketing Mix and grade two winner Dark Cove, which suggests trying daughters of the Kris S. stallions Arch (whose son Blame is from the family of Sadler’s Wells), Prized (broodmare sire of an El Prado line grade one winner), You And I, Rock Hard Ten and Kissin Kris. Medaglia d’Or also has a stakes winner out of a mare by Roberto son, Dynaformer, and a son of Medaglia d’Oro has a stakes winner out of a mare by Mister Baileys. There are also El Prado line stakes winners out of mares by Roberto sons, Silver Hawk, Red Ransom and Lear Fan. Roberto is a Hail to Reason line stallion, and Medaglia d’Oro has done well with mares carrying Hail to Reason son, Stop the Music, through Cure the Blues, who appears in the broodmare sire line of two Medaglia d’Oro line stakes winners, and also in the pedigrees of Rachel Alexandra and Gabby’s Golden Gal. Cure the Blues might be brought in through American Chance or Tethra (broodmare sire of a Medaglia d’Oro stakes winner). Another Hail to Reason son, Halo, appears in the pedigrees of ten Medaglia d’Oro line stakes winners, including through daughters of Jolie’s Halo, Saint Ballado (sire of SaintLiam, Yankee Victor, Straight Man, Captain Bodgit, Sweetsouthernsaint and Flame Thrower) and Devil His Due (by Devil’s Bag, also sire of Diablo). Introducing Halo through More Than Ready should also work well. In general, Medaglia d’Oro has done well with the Seattle Slew line. He did sire Kentucky Oaks (gr. I) winner Plum Pretty out of a mare by Seattle Slew son, A.P. Indy, but overall, his strike-rate with that branch is not impressive, and it is a cross to treat with caution. Medaglia d’Oro does have a good strike- rate with mares by Seattle Slew son Capote (sire of Boston Harbor and Matty G; grandsire of Mayakovsky), and also has a stakes winner out of a mare by Capote’s three-quarters brother Williamstown. From other Seattle Slew line broodmare sires, there is a graded winner out of a mare by Doneraile Court, and stakes winners out of mares by Fast Play and Vindication. The Blushing Groom strain has proved very positive for Medaglia d’Oro, and he has a stakes winner out of a mare by Rahy, and a graded winner out of a mare by that horse’s son, Fantastic Light; a graded stakes winner out of a mare by Wekiva Springs (by Runaway Groom, sire of Cherokee Run, grandsire of Kafwain and Yonaguska), a graded stakes winner out of a mare by Blushing John, and a stakes winner out of a mare by Rainbow Quest. This also suggests trying mares by Mt. Livermore and his sons Housebuster, Orientate and Peaks and Valleys.